I'm a writer, and I don't believe the language in this agreement is unfair at all.I would think the relationship between writer and agent would be one based on mutual faith -- the agent having faith in the writer's work and the writer having faith in the agent's ability to market that work to publishers to the best of the agent's ability. I'm sure there must be hundreds (if not thousands) of great books that never sell despite genuine, valiant effforts made by agents. So, why should an agent not get some compensation for the time, energy, and cash spent even when, unfortunately, the market doesn't respond favorably to the writer's book? $150 really doesn't sound like a lot of money for an author to render up in exchange for all the photocopying, shipping and handling, phone calling, and emailing (and yes, emailing does cost money because most agents don't have free Internet access, unless of course they work out of the basement of their local library), among everything else the agent has to deal with. Really, Miss Snark, how many manuscript submissions can you send out with $150 and still afford to stock your bar with quality gin? It's not like the agent who offered this contract is trying to rob the writer blind. Why does everybody in this world want everything for free??? If a writer has confidence in both his work and his agent, then forking over $150 isn't asking for a whole heck of a lot. In exchange, the writer should just ask for itemized expenses reported back to the author and proof of submission in the form of written responses about the writer's work from editors. THIS is exactly why an agent should not charge writers for expenses unless the work is sold. First, it's not about the amount of money. $150, $15, $15000...it's all the same because authors do not pay agents. Get it? And the idea that "why does everybody in this world want everything for free?" completely misses the point. Authors are willing to pay. Authors are beggging to pay. Authors WILL pay if you ask them. That's why you don't. Agents are professionals. We assume some risk in this venture as you do. And I can afford to send your work out till the cows come home becuase I MAKE MONEY. My agency makes money selling work. I get a percentage of that. Get it? We make our money when we PERFORM, when we sell your work. Submissions are important but selling the work is what separates the sheep from the goats, or in this case professional agents from people who want to say they are agents but don't like doing the work. This is an unbendable, unbreakable rule: DO NOT PAY AGENTS. Not reading fees, not expenses, not nothing. There's something churlish about billing the $150, regardless of whether the work is sold. If the agent is any good at all, the time and effort and know-how she's put into the unsuccessful project are worth many times that $150. Why, then, would the agent refuse to absorb that piddling sum? Why pass it on to the disappointed author? Miss Snark said something a moment ago about an author's breaching an exclusivity agreement, and what does that say about the author? Well, what does such nickel-and-diming say about an agent? That she thinks a stack of photocopies worth more than her own skills, I should say. 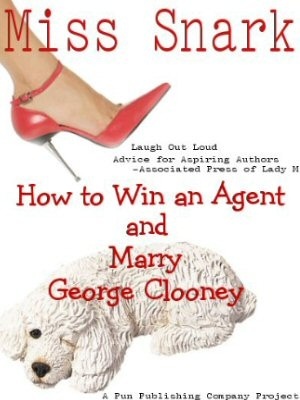 That agent's authors might just as well go to Kinko's. I'm feeling very sententious this morning. I agree. If the agent is worried about that kind of money, then she shouldn't have taken the author on to begin with. The agent should have confidence in her skills--and the writer's skills--and if she thinks she may need to bill the author... What's that say about her? It *is* about mutual faith. If your agent is making money (from her relationship with you) when you are not, then she is a parasite. It's your book, and she should not be making money off the fact that you wrote it unless you are too. You hire an agent to sell your book, therefore you pay her for selling the book - not for photocopying it. When the book sells, the photocopying expenses might show up on your bill, but you don't need to pay someone for services not provided - and the only service you hire your agent for is to sell your book. She didn't sell it? Then you don't pay her. "I'm sure there must be hundreds (if not thousands) of great books that never sell despite genuine, valiant efforts made by agents. So, why should the writer not get some compensation for the time, energy, and cash spent even when, unfortunately, the market doesn't respond favorably to the writer's book?" Why should the agent get paid when the writer won't? This is not supposed to be a business partnership. You provide the product, the agent finds a buyer. When you get paid, so does the agent. By not paying the agent in advance, you've created an incentive for the work to get sold. But you've also created a situation where the agent is only going to take your work unless they believe it can be sold. Which means your work better be good.